This is a 4 part fermentation series. If you missed part I last week, click here to read Are Probiotics The Answer For Everything? Beyond supplementation, there are other ways to incorporate more good bacteria into your diet to support the health of your gut. Maintaining a balanced diet with plenty of fiber is key but another really important one is fermented foods. When a food or beverage is ‘fermented’ it has been transformed in some way by bacteria. During the process of fermentation, acidifying bacteria proliferate, which makes it difficult for pathogenic bacteria to survive (similar to what we discussed in part 1 - how ‘friendly’ gut bacteria create a slightly acidic environment in your gut to stop pathogenic bacteria from spreading). Because of this, fermented foods are actually very safe. In fact, fermentation has been used by humans for almost 10,000 years as a preservation method, for the health benefits, and to produce alcohol (of course). Fermented foods are super nutritious and can be really beneficial if you have digestive problems. The bacteria and enzymes in fermented foods actually help you digest other foods. They do this by making the “hard-to-get-to” nutrients in foods, like proteins and minerals more bioavailable. Grains, seeds, legumes and nuts contain something called phytic acid which is essentially their protective mechanism that binds to and inhibits the absorption of some minerals. This is also why some people get bloated after eating too many of these foods. Fermentation reduces phytic acid, making the minerals within those foods available to us. In fact, often the fermentation process will create new vitamins and enzymes. For example, the bacteria in our gut synthesize many of the B vitamins. Fermented foods have also essentially been predigested by the bacteria so they’re easier to digest and absorbed by our bodies, which ultimately reduces indigestion and bloating. If you often experience indigestion, adding some fermented foods to your meal can help. They act as a digestive aid, helping to stimulate stomach acid levels and helping with the digestion and breakdown of our foods. The best example of this is apple cider vinegar which can help with acid reflux and heartburn. 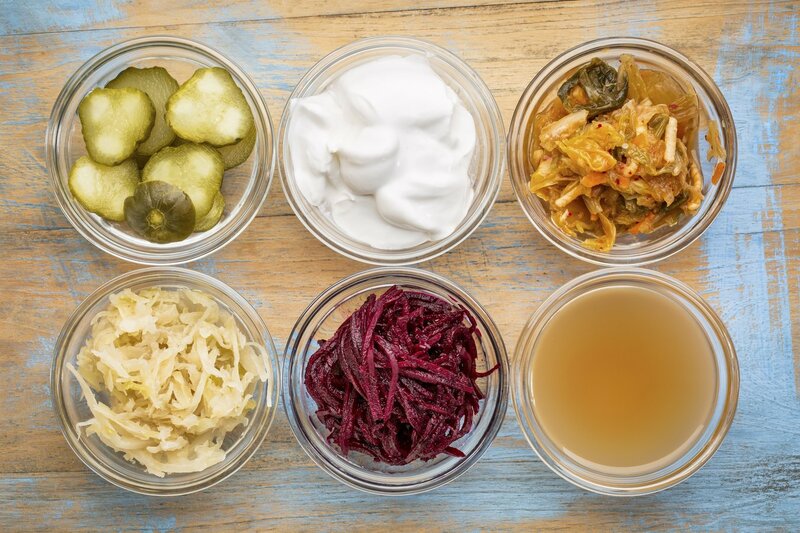 A variety of fermented foods should be consumed every day. Traditionally, they were meant to be used as seasonings or sides but the key is not to overdo it. Just one teaspoon of good quality fermented veggies can have roughly 1 billion probiotics. Your best bet is to start with a bit and work your way up depending on your tolerance. Just remember - sometimes there can be a ‘die-off’ reaction as you introduce the good bacteria. This can result in gas, bloating and discomfort, but is usually short lived (and a good sign!) If you experience it, reduce the amount you’re consuming and work your way up slowly. This goes for probiotic supplements as well. Keep in mind that many of the above fermented vegetables, if bought from the grocery store and not in the refrigerated section, wouldn’t have been traditionally fermented. Most store bought pickles for example taste sour because of the addition of vinegar and/or wine and not because beneficial bacteria made them taste that way. Keep an eye out for these ingredients. Your best bet is to go pick them up from the health food store or to make them yourself, which we’ll be explaining in part III of this fermentation series! (4) Dr. Brenda Lessard-Rhead, BSc, ND. July 2015. Nutritional Pathology. 3rd Edition. Richmond Hill, Ontario, Canada: CSNN Publishing.